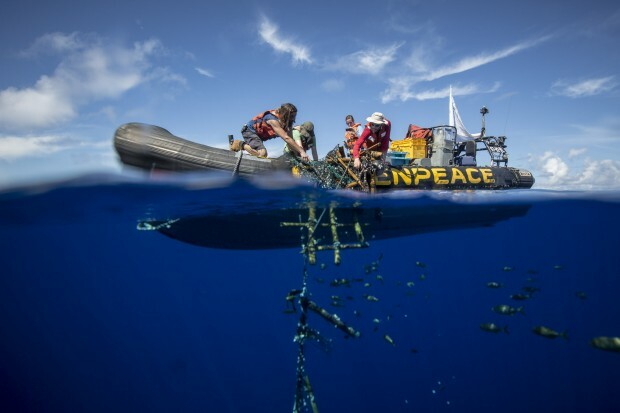 Photographer, Will Rose, joined Greenpeace activists on an expedition to the Indian Ocean to remove dozens of destructive Fish Aggregating Devices. These FADs kill endangered marine life including sharks and turtles, but despite this, leading tuna brands John West and Thai Union continue to use them. Since our campaign launched, Tesco and Waitrose have threatened to remove John West from their shelves unless they clean up their act. Q: What was your role during the Esperanza’s latest expedition? 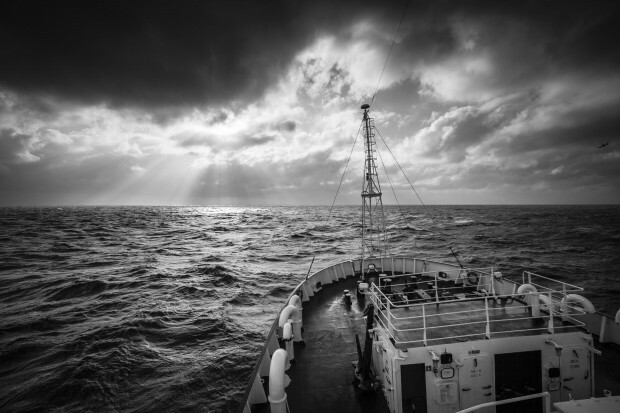 My role during the expedition has primarily been as a photographer, but there are lots of other roles that you must step into when working on a ship. Being part of the crew and taking on ship duties is really important. Things such as cleaning toilets, mopping alleyways or cooking for the crew to allow our chefs some time off all play an important part in keeping crew morale high and making an expedition like this possible. 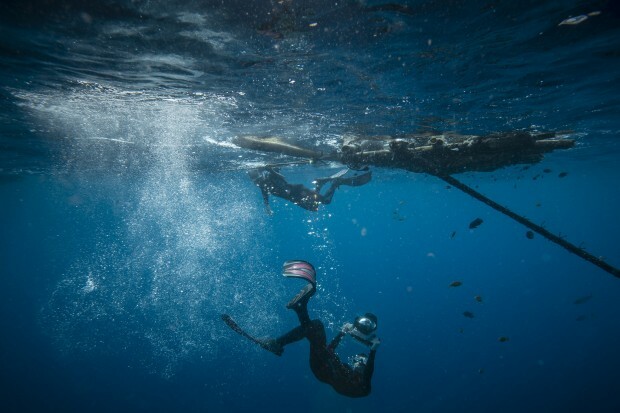 Q: What was a typical day out in the Indian Ocean like for you? A typical day for me starts at 05.30 with a wake-up call from a watch-keeper. Apparently I am one of the most difficult people on the ship to wake up, requiring a shove to get me out of bed. At 06.00 I start my “FAD watch” from the ship’s “monkey island”. A FAD, or Fish Aggregating Device, is a bit of fishing gear which is used to gather all kinds of marine life, including sharks, which are then scooped up in big “purse seine” nets. 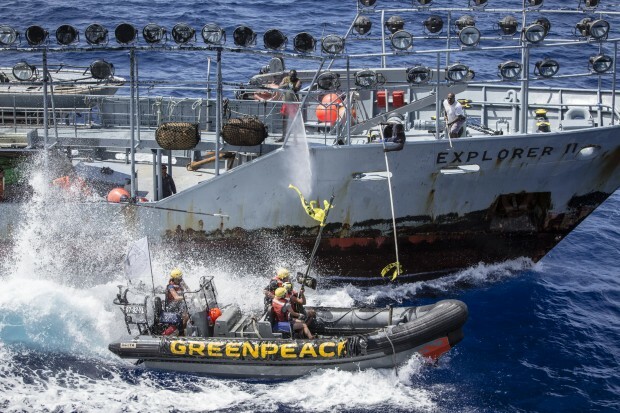 This is the kind of destructive fishing gear that Greenpeace is out in the Indian Ocean looking for – especially ones linked to John West’s owner Thai Union. 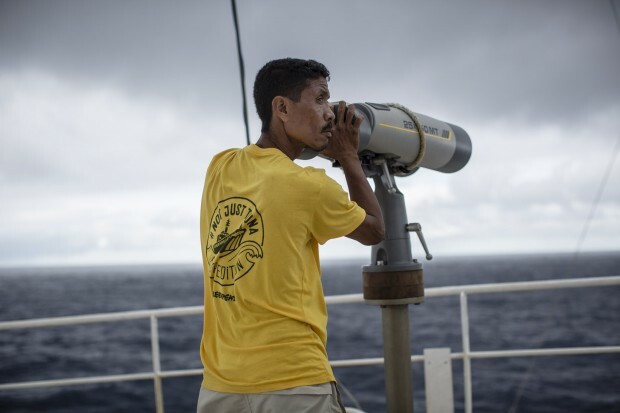 I usually sit with my coffee and scour the horizon for buoys and beacons for two hours with a huge pair of binoculars till 08.00 when our daily ship cleaning duties commence. At 08.30 I have a meeting everyday with the campaign and logistics team where we discuss and formulate plans for the day. After that I am usually running around taking pictures until the evening when I do my editing. Sometimes there’s time for a film in the lounge or a bit of guitar, but mostly I’m working all the time. Q. What special equipment did you use during this trip? For a trip like this I needed quite a range of kit. One minute I’m in the helicopter and the next I’m in the water swimming with sharks. I have used underwater housing for my camera with a special dome port for taking good half-in the water and half-out of the water shots. These pictures have been important in communicating what a so-called Fish Aggregating Device (or “FAD”) is, and showing the process of Greenpeace removing them from the ocean. I also have two camera bodies, six lenses, clamps, remotes, dry bags, flippers, snorkels, masks, hard drives and a whole load of other gear. Q. Which photograph are you most proud of, and why? The most challenging thing is to coordinate. 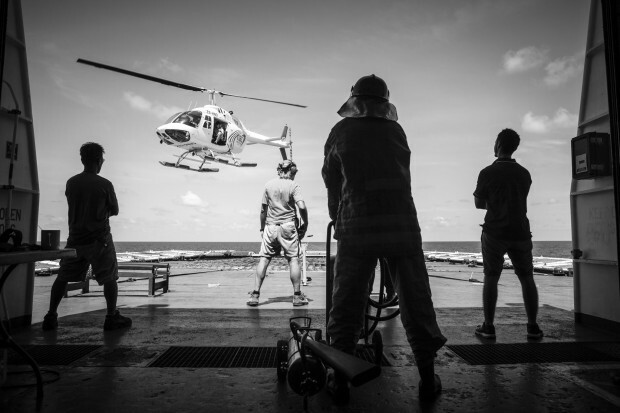 It can be a daunting task to have a ship, inflatable boats (or “RHIBs”), a helicopter and a crew of people waiting for you to tell them where to go. For this half-and-half shot, I had to coordinate from the water by shouting messages to the boat driver who then radioed to the Esperanza. I knew I would only get a few seconds where everything lined up, so I had to position the RHIB and get the guys to start hauling the FAD at the right time. It was a lovely feeling when everything came together, but it only lasted for four seconds before the RHIB drifted and the Esperanza moved out of shot. As I was bobbing around, the camera was moving and the waterline was constantly changing, I only have two decent frames. Not the best picture from the tour, but one that I was happy to make happen. Q. Why is photography such an important part of actions like this? Bearing witness is a core principle for Greenpeace and a camera gives the opportunity to show what is happening in the world to people everywhere. 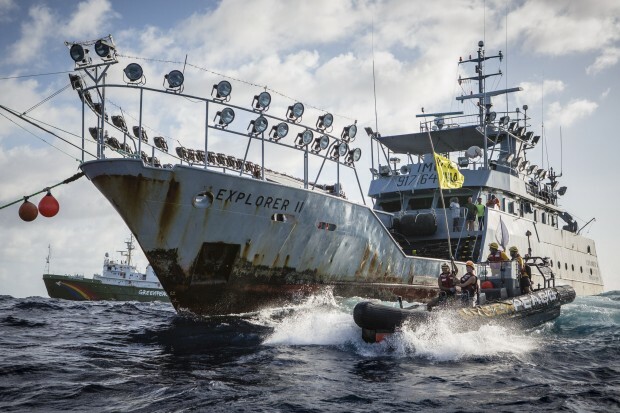 I have worked in really remote places for Greenpeace over the past ten years – places that would usually be inaccessible or impossible to reach without the resources Greenpeace has. This trip is a great example. We’ve been out in the middle of the Indian Ocean trying to expose fishing practices that are stripping our oceans of life. Large fishing vessels and companies are getting away with whatever they want out here as they are out of the public eye. Photographing what’s going on gives me the opportunity to show the public a glimpse into a world that isn’t usually seen. Q: What was your most memorable moment of the expedition? There have been too many memorable moments to mention. I would say exposing the practices used by Thai Union and the tuna industry, diving under FADs and witnessing the wonderful wildlife in the Indian Ocean or seeing a huge sperm whale swimming directly under our helicopter. 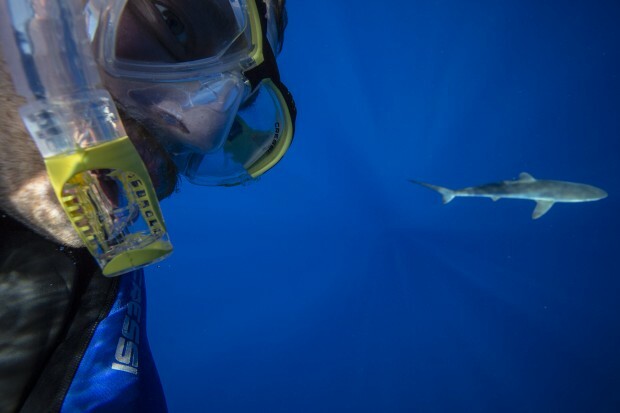 There have been little moments that I’ll remember, however, things like the “shark selfie” competition I have had with videographer Fionn Guilfoyle, playing the drums on the poop deck of the Esperanza and attempting to sing in Malagasy in a karaoke bar in Madagascar during a port stop. Oh, and my bridge breaking off and having to be at sea for seven weeks without my front tooth. I won’t forget that in a hurry.